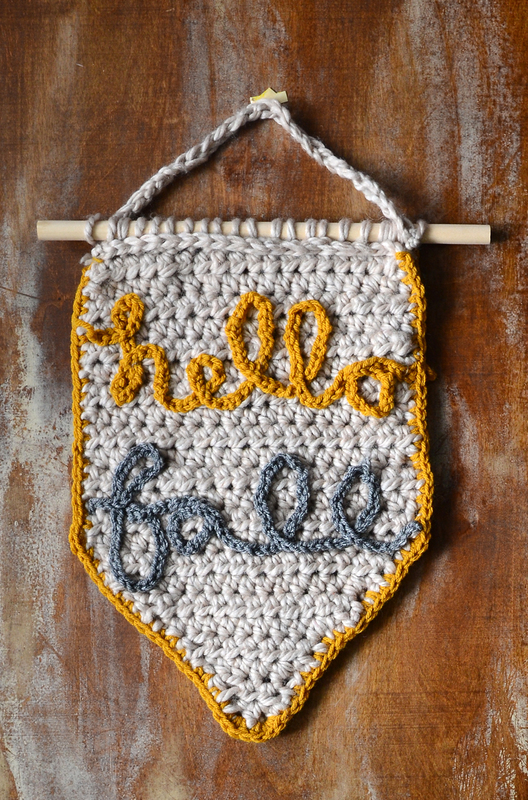 ' Hello Fall Home Décor Crocheted Banner - Sisters, What! This crochet banner is a quick project and perfect for the beginner crocheter. You can just do Hello and put it up all year around. This post first appeared on Crafts Unleashed blog. Somehow summer just goes by way too fast and we end up in September that is filled up with school, sports and other activities. I yearn for summer and just want everything to slow down. Soccer starts for us when school starts and as much as my kids love it, I secretly can’t wait for it to be done. I really just yearn to slow down. Crocheting is just the way I do it. (did you catch my no crochet hook chunky scarf with leather tutorial?) Crocheting isn’t a fast craft but the repetitive nature of it is very soothing and helps slow down my brain. I really don’t do it enough, but I loved getting my yarn out for this Hello fall sign. As I wrote this post, I realized I might becoming a little obsessed with the phrase hello fall as seen in this hello fall chalkboard sign and this hello fall pillow (which turns into a let it snow pillow). But, what can I say, I’m excited for fall :). Something fun about this banner is it has the elements of hand lettering and you could totally leave off the fall for all year long sign. row 18 start decreasing on each side. Basically when you turn to start a next row, skip the first crochet stitch. When you reach the end of the row, skip the second to last stitch. Do this for the next 9 rows. Finish off the last row. Now you’re going to take your contrasting color of choice yarn and start crocheting a long chain. Start shaping your words in cursive and once you have a long enough chain to form the words, place on the banner. Using a yarn needle and match yarn sew the letters carefully to the banner. Do this for the word fall as well. Now single crochet around using your contrasting color. Start at the top of one side and go around until your to the other side. Now it’s time crochet it to the top of a dowel. Basically you’re going to do a single crochet stitch but before pulling the yarn through, wrap it around the dowel. And that’s it. This would be a fun banner to make with just the hello or even with different words.